Lopesan Villa del Conde Resort & Corallium Thelasso is the ideal hotel for couples looking to relax and unwind, with everything taken care of. Whether you want to soak up the sun by the pool or on the beach, make the most of the delicious cuisine served up in the many restaurants or take in the beautiful architecture of the resort, you’ll find fantastic facilities here. Head to the spa and enjoy a range of treatments, including body wraps and facials, as well as international inspired massage options. In the evenings your large and spacious room offers a comfortable setting for relaxation, while the restaurants serve a la carte or buffet dining options. Hotel child prices apply to ages 2–12 years. The hotel has 561 rooms. Specially modified rooms for people with reduced mobility are available on request. Located by the swimming pool and overlooking the glistening ocean, this trendy pool bar is the perfect place to enjoy snacks, refreshments and light bites throughout the day. Enjoy the beautiful bright décor, pretty conservatory area and rustic décor as you choose from authentic Italian dishes, including pizza, pasta and sharing platters. Men are requested to wear long trousers at dinner. 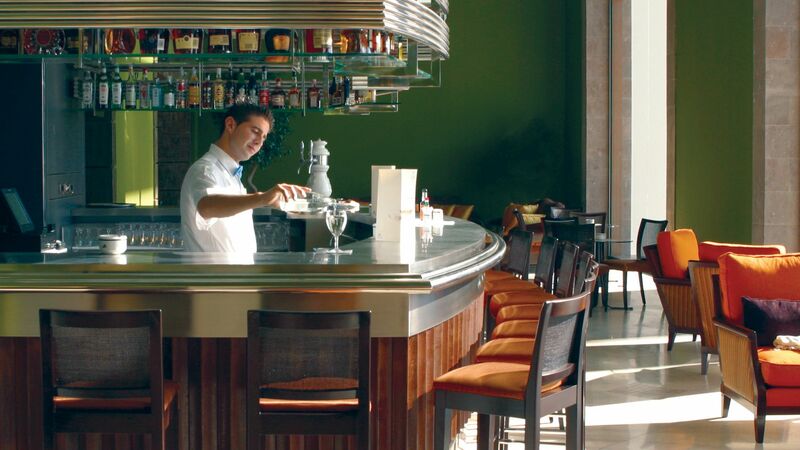 Located in the hotel lobby, this vibrant bar offers a range of unique cocktails and fine wines. Listen to the sounds of the piano as you relax with a drink. Choose from a la carte dishes and a salad buffet including succulent grilled meats and fresh seafood. Overlook the swimming pool and soak up the sun or relax in the shade. 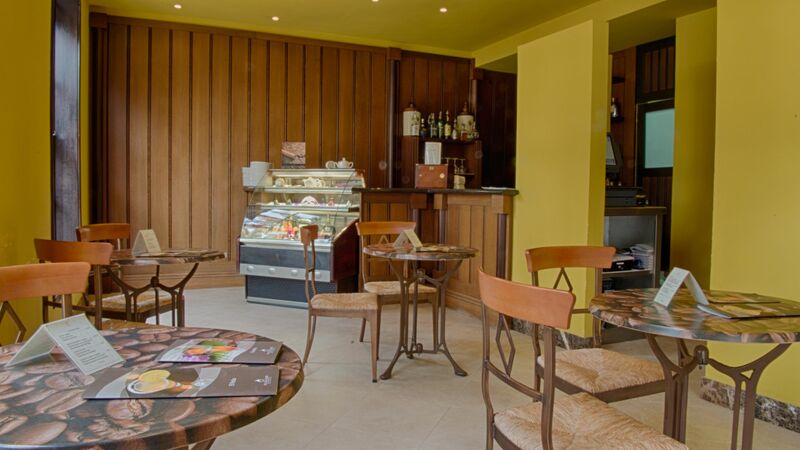 El Patio Terraza offers a complete bar service including speciality coffees and a selection of sandwiches, cakes and waffles. 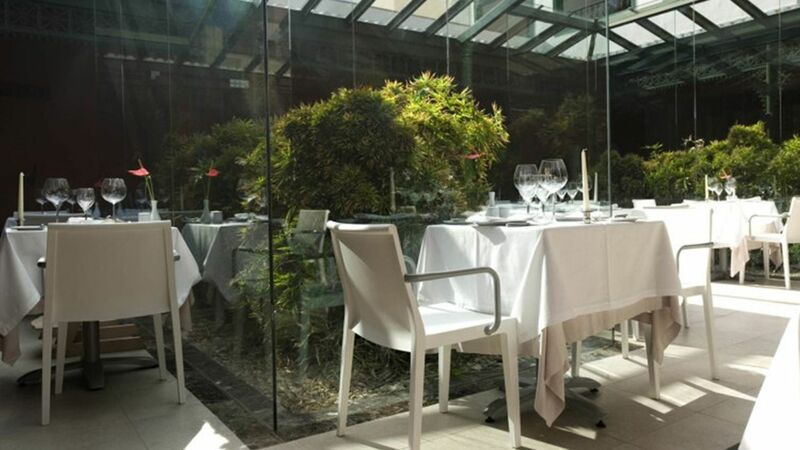 The al fresco terrace is in a pretty courtyard surrounded by palm trees and the elegant hotel buildings, while inside is spacious and modern, making this the perfect place to relax. Choose delicious options from the international buffet. Hot and cold dishes are served buffet style for both breakfast and dinner. 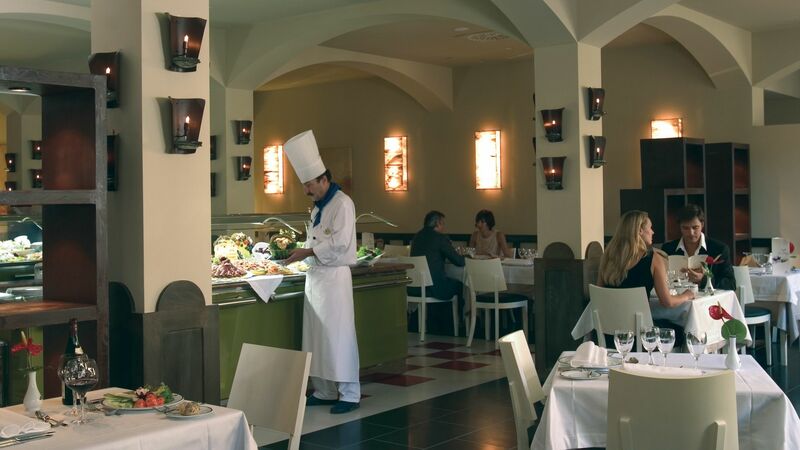 Watch the chefs at the show cooking stations during dinner and enjoy international options at the buffet. Located next to the hotel’s square, this pub is the ideal place to relax with a drink before or after dinner. 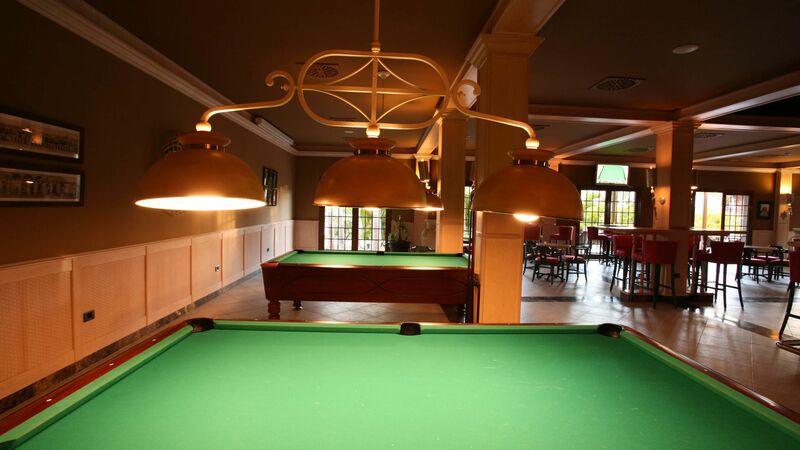 Billiards tables, live sports games and more are offered. 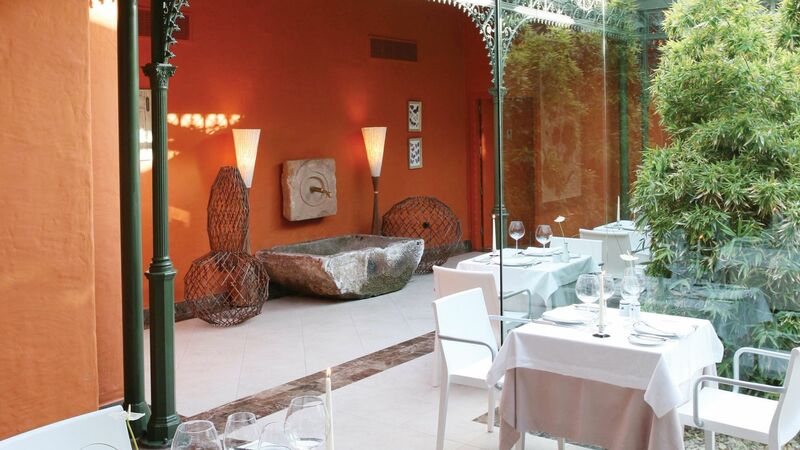 This luxurious and elegant restaurant offers fine dining options, including international and local delicacies. Choose from succulent grilled meats, fresh salads and more. There are five freshwater swimming pools and one saltwater pool, each surrounded by the exotic hotel gardens. 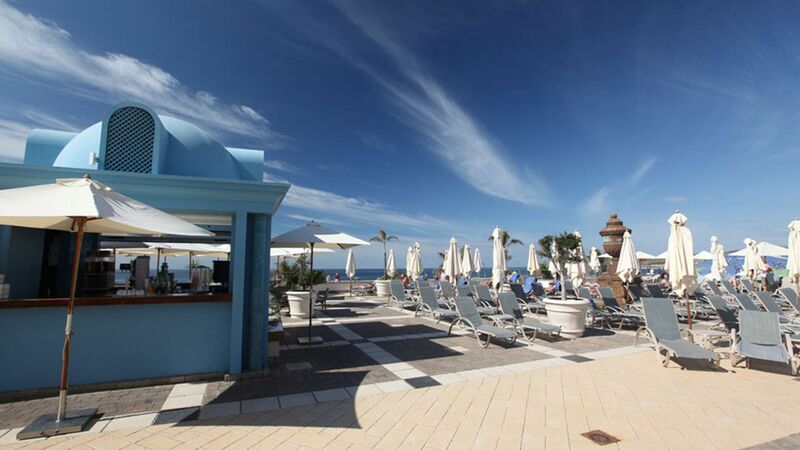 Relax on loungers on the sun terrace or enjoy light refreshments at one of the pool bars. 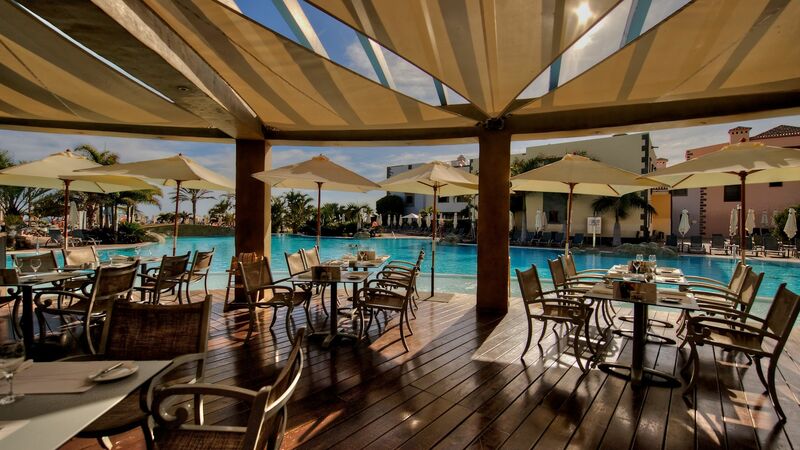 Located in Maspalomas’ national park, the Lopesan Villa del Conde Resort is surrounded by golden sand dunes and the sands of the beach, perfect for both relaxing and exploring. Choose from a range of treatments at the hotel’s luxurious spa. 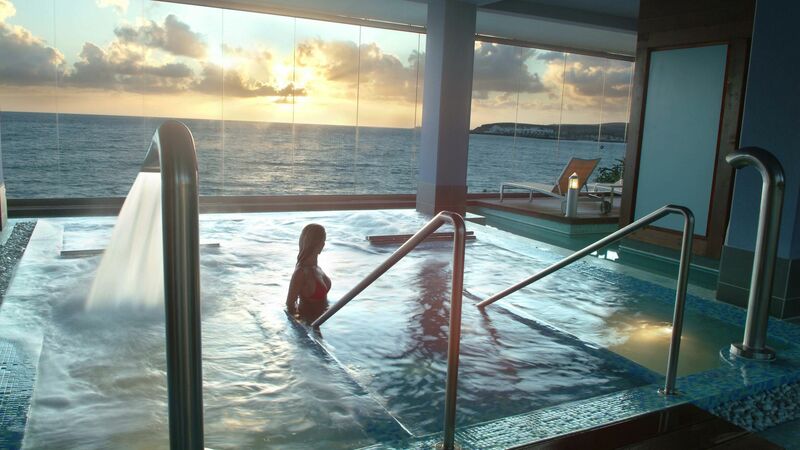 Take in the views over the ocean from the jacuzzi, as well as enjoying the thermal circuit. There’s also a Finnish sauna, steam bath, vitality pool, flotation pool and adventure showers. The hotel’s gym is fully equipped and air conditioned, perfect for those wanting to keep fit during their holidays. A range of sports facilities is available at the Lopesan Villa del Conde Resort & Corallium Thalasso. Choose from tennis, cycling, golf, hiking and lots more during your stay. Lopesan Villa del Conde Resort and Corallium Thalasso can be found in lively Playa Meloneras, on the south coast of Gran Canaria. With wonderful weather most of the year round, as well as golden sandy beaches within easy walking distance, it’s ideally located for those wanting to soak up the sun. Foodies will love the selection of restaurants and bars dotted along the coastline, while nature lovers can explore the sand dunes. Maspalomas Golf Course is just 10 minutes away from the hotel, and offers an excellent clubhouse, challenging course and spectacular views of the dunes. If you prefer to indulge in some retail therapy, there are shopping centres and little boutiques dotted around the town. 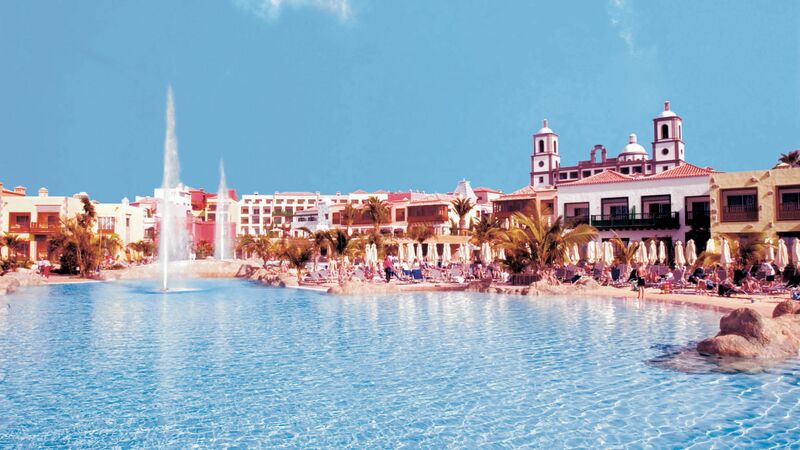 Lopesan Villa del Conde Resort and Corallium Thalasso is a 25 minute drive from Gran Canaria Airport. Double Standard Economy Rooms are decorated in neutral colours and have a living room area with sofa bed. The bathroom has a separate bathtub and shower. Some economy rooms do not have a balcony and may have restricted view. Double Standard rooms are decorated in light tones and have a living room area with sofa bed. The equipped balcony offers views of the garden and the bathroom has a separate bathtub and shower. Double Standard View rooms have a living room area with sofa bed, the bathrooms have a separate bathtub and shower. Balconies in these room types are available with an open or closed balcony and are fully equipped also with beautiful views of the sea. Junior Suites are modern in design, spacious and feature a separate living area to the bedroom. The large balcony offers views of the garden and the bathroom has a bath and separate hydromassage shower. Guests receive a daily newspaper and complimentary wifi access. Senior Suites are elegantly designed, spacious and feature a separate living area to the bedroom. The terrace is fully equipped and with sea views. Guests receive a daily newspaper and complimentary wifi access. Double Deluxe View rooms are situated on the top floor of the hotel and feature a large terrace which is equipped with sun loungers and parasols and views of the sea and resort. Inside, there is a double bed, dressing room, sofabed and en suite bathroom featuring a separate bathtub and shower. Single parent offers are available at this hotel, please contact our Trusted Advisers for more information. Sovereign guests will receive one bottle of Cava in their room on arrival plus one complimentary Thalasso Spa Circuit per adult for holidays until 31 October 2019. Second time of staying and still exceeds all other hotels on the island, in my opinion. Very spacious rooms and excellent staff - special thanks to Cesare and the animation team in particular. The design of the hotel is very attractive. Half board food is excellent. Most definitely recommended. Only one downside; charging for WiFi in the room seems very petty and not appropriate for a five star hotel; other than that hard to find any fault. Thank you again team! Room was clean big and all avalible. Location is very nice nearby all shops and on the start from the sops. Food the best I have, best stay you can wish, cleanness, pools, gardens, beds quantity, space, service, food workers, room, quality ever seen. And perfect location.